Sometimes this is an incredibly hard thing to do, just shrugging off an insult or unkind words that somebody may have said to you or about you. It takes great wisdom to know how to do that and great wisdom to know how to respond appropriately. To be able to shrug off an insult we need to be firmly rooted in our identity as a child of God. That He created us in His image, we are wonderfully made, we are forgiven and set free, loved unconditionally and righteous. Insults that may come our way can not make us second guess ourselves because we are all these things and more. Yes we are human and are therefore not perfect, and yes we always have things in our lives that we need to be working on but our identity as a child of God always remains true. When the insults come your way, stop and remember your true identity and do not let the insults take any ground in your mind and in your heart. Remember what God says about you, after all that is the only opinion that truly matters. Try and rise above the situation and not enter into an exchange of unkind words. Reckless and hurtful words are like the thrusts of a sword and it is not going to end well. We need to have Gods wisdom hidden in our heart so that when we go to speak, only His wise words are what comes out of our mouths. We know that the greatest commandment that Jesus left for us to do is to love other people and sometimes that is the hardest thing to do. One thing that I try to always remember when I am interacting with other people is to see the goodness that is inside of them. To see them as God created them to be and not how they may be behaving in the heat of the moment. 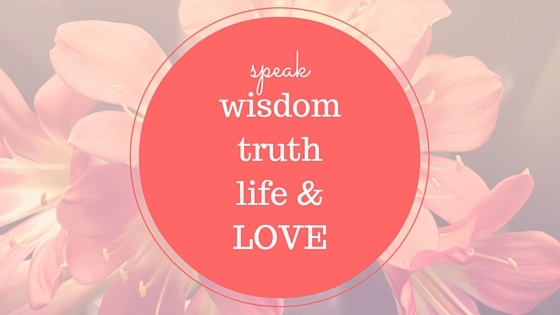 Father God we ask that you help us to always speak wisdom, truth, life and love. Help us to see the goodness in one another and to draw that goodness out and into the open. Help us to be a people who seek to build one another up and not to tear one another down. Amen. This is really good and encouraging. So so true!! !